"Clyde" is a 2017 AQHA registered, DNA parent verified colt that is bred to eat up the barrels! Enrolled and paid in Full to Western Fortunes and Cowboy State incentives. Other Incentive Eligibilities: Colorado Classic, Glacier Chaser, Southwest Desert Classic, VGBRA, and Wyoming Bred flat track race owner incentive. This colt has been on the correct feed program since before being foaled to insure maximum performance and athletic opportunities. Dewormed every 8 weeks, current on vaccinations and foot care. Sound, no scars, blemishes or vices, correct conformation. Foaled April 2017. 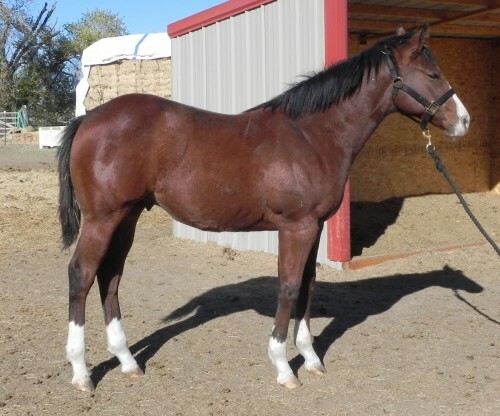 Video attached of this colt shows some of the handling and training all our colts are exposed to. Last two pics are sire (grey) and dam. Sire: ROYAL QUIK FRENCHMAN a barrel racing $$ earner who has a winning combination of conformation, disposition and athleticism that he is consistently passing on to his progeny. The legendary race lines of First Down Dash and Harems Choice combined with one of the greatest crosses in performance horse history, Sun Frost and Caseys Charm make his pedigree one of the most unique crosses in the industry today! Grade 1 Speed crossed on Rodeo Royalty!! Please call 307-202-0736 for more info.